UPDATE: An anonymous commenter has said that (at least some of) the men here are students at a well-known yeshiva for Americans in Beit Shemesh. I went to the yeshiva's website -- some of my students have studied there -- and identified (I think) two of the students. In this day and age, and with my contacts, I could find out who they are. But the story is not about these particular students. They were singing Hebrew songs to drown out the Palestinian woman who was clanging a plate. It was a disgusting display of insensitivity, hatred, and contempt for a woman thrown out of her home to make way for racist bigots. But I still say that it is not about this particular yeshiva, or these particular men. It is a bigger problem. So I am not going to pursue it. This is the same post as the one below, but the version for subscribers has been formatted better. Gentlemen, I address this to you because I know you personally and admire you greatly. I have been members of the same synagogue as you, and one of you has been my rabbi. Perhaps you saw this picture in the Wall Street Journal blog online The caption that the world read was, "A Palestinian woman whose house has been occupied by Jewish settlers argued with Israelis who came to celebrate Jerusalem Day in the mainly Arab neighborhood of Sheikh Jarrah, East Jerusalem, Wednesday." But you knew that the caption was wrong. You looked at those faces. You knew that the laughing faces were not of Israelis, but of modern orthodox Jewish youngsters from the US, probably in yeshiva for their gap year. You may have even recognized some of them. You may know some of their parents. "Where have we gone wrong?" At first I was exhilarated by Rav Aharon’s hakarat ha-het, his recognition of the sin and its vicious consequences, and of the need to correct it. But time passed, and nothing was done. Rav Aharon went back to his yeshiva, and every time some modern orthodox Jew stunned the world with his indefensible actions -- Baruch Goldstein, Yigal Amir -- we were witness to the same hand-wringing among the moderates, as well as the old defense mechanisms:"Who are you to criticize?" "We condemn their actions, but not their intentions." "Look at the hatred and bigotry of Islamic Fundamentalists." So let me tell you why your children -- not all, but enough of them to get you worried -- will continue to be in pictures like the one above, or in movies like Max Blumenthal and Joseph Dana's “Feeling the Hate in Jerusalem.” Let me tell you why the bigotry will range from the not-so-genteel Islam-bashers that you find in every shul nowadays (when you were growing up, who knew from Islam?) to the "glatt kosher, mehadrin" bigots and hate-filled thugs in the picture. The main source of Jewish hatred and bigotry against Arabs today comes from the orthodox, and especially the modern orthodox. This wasn't always the case. The orthodoxy that sprung from European soil absorbed the best of West civilization, culture, and morality. The earlier generations of religious Zionists, Rav Reines, Rav Kook, Rav Soloveitchik, were European to the core. And the early generation of religious Zionists in America, though fed the prejudiced Zionist line about the Arabs, nevertheless was deeply influenced by liberal American values, and the American rejection of bigotry. Such moderates even convinced themselves that this was the message of the Torah. Modern orthodox educators in America should have worried less about the color of their children's hats, and more about the color of their hearts. When they agonized over whether they would stay frum, they should have agonized over whether they would stay mentshen, humane individuals. 1. Day schools should develop programs against prejudice, and I don't mean just prejudice against Blacks and Hispanics, although that is important, too. I mean programs to counter bigotry against Arabs and Muslims. Appropriate sources can be found in Torah sources to give this a Jewish cast, and the illiberal sources can be explained away, as they were explained away by the 19th and 20th century European rabbis. One can start with Rav Abraham Kook's view that the land of Israel can be sold to Muslims because they are not idolaters. 2. Schools should invite Palestinian refugees to speak to the students about their experiences. That would be a kiddush ha-Shem/sanctification of God’s name in its own right, and the educational value would be enormous. I am not saying that equal time must be given to Palestinian spokesmen on the conflict. This is not about politics. It is about humanity and decency. Oscar Hammerstein wrote, "You've got to be taught to hate," but in a particularistic, religious atmosphere, and in the middle of a conflict, you have to be taught to respect. I realize that taking any time away from the curriculum for "tikun olam" is controversial, and trying to humanize Arabs will be even more so. After all, it is not as if when you look over your right shoulders, you see any less bigotry and racism. But choose not to, and you will have more pictures like the ones above. And what decent human frum Jew would want that? 3. American Muslims should come to the high schools and talk about their religion -- or if that is too much for you, then find Jews, frum Jews, who will try to provide a positive portrait of Islam. It is easy to cherry-pick sources to portray another religion in an unflattering light. But that is where bigotry begins, and when it is "supported by the evidence" it gets harder to eradicate. Do to the Muslim sources what we do to the Jewish sources in day schools -- accentuate the positive while explaining away the negative. 4. Modern orthodoxy sees the Rambam/Maimonides as one of its great models. Make it known to your students that Maimonides was Islamic civilization's gift to the Jews. Without the Islamic environment, there could have never been a Rambam. The influence of the golden age of Islamic civilization is written on every page of his works, and I mean his legal works as well as his philosophical ones. And, as you know, it is not just Rambam. 5. Don't romanticize the history of Jewish-Arab relations, but don't demonize it, either. Yes there was Muslim discrimination against Jews, but it has been the bon ton of late to exaggerate it and to fail to understand the problems of any traditional religion dealing with other religions when it has political power. I wouldn't want to be a Christian living in the Land of Israel under a Jewish king, according to Maimonides' law that condemned them to death. 6. Always draw parallels from other people's bigotry to our own. Bigotry and xenophobia are universal phenomena. The same Jews who are revolted by what others have done to them should feel the same revulsion when they do it against others. Show zero tolerance for such bigotry. 7. Most important, give the proper preparation and training for students going to Israel in their gap year, a year with little supervision and with exposure to deeply racist and bigoted attitudes – all in the name of Torah. If they come back from Israel not wanting to talk to girls, you get nervous that they have fallen off the deep end. But what of their attitudes towards gentiles, especially Arabs? Aren’t you worried about that? It is not enough to ask, where have we gone wrong. We have to take steps to stamp this out. Liberals, conservatives, democrats, republicans – all of us should work to eradicate the central illness with frum Judaism today – hate-filled bigotry. is there much of chasm between the picture that prompted your open letter and the views of beinart, who complains about the weakness of liberal zionists in one breath and firmly states that he's opposed to equal rights for palestinians in israel in another? i hope your views reach and convince the right people. not really the same post, as you added to its absurdity with your concluding comment. those who work with the many kids who have gone off the derech would gladly argue your assertion that bigotry is the central illness affecting judaism today. those in the kiruv movement, who work to halt assimilation would also disagree with your premise. i am not surprised by your beliefs. this is what happens to those who spend more time with the richard silversteins of the world than other torah jews. and im sorry jerry, but it is you who is the bigot. for it is you who is generalizing your perception of one incident (and one very skewed, biased video) to an entire group of people. what is this entire post, but just another screed against frum jews? wouldnt expect anything more from a man who has absolutely no problem besmirching the name of rav yaakov weinberg zt"l.
Yup. At least three of those kids are students at Reishit Yerushalayim, a Yeshivah that caters predominantly to Americans. I also looked at the Reishit site's gallery. But that doesn't change the fact that the photo distorts the reality of what was actually going on. The Al-Ghawis and the Al-Kurds are angry and they do not hesitate to dish it out. Like you said, all these kids did was sing Hebrew songs in response to the woman's clanging (was that Um Kamel?). All in all not a very remarkable incident, certainly not something that ought to have inspired insipid comments like "saw this photo and decided not to be jewish anymore http://is.gd/chBxT" ( http://twitter.com/mobius1ski/status/14367147159 ). Like I said before, MO Judaism can stand to teach a little compassion and a lot more Derech Eretz to its kids - but in making that point, lets try not to distort reality, mmmkay? I am sorry that I jumped to conclusions that this pictured showed "hate" by these religious kids, but then I read Jewlicious's commment and I then realized that the picture shows no such thing. I have seen such propaganda put out by "progressives" in the past and I should have known better. For example, one of the "support Gaza" groups was claiming that there is "famine" in Gaza due to the Israeli and EGYPTIAN blockade, and in order to arouse our righteous indignation, they included a picture of an Arab women (or really, a woman in Arab dress-I don't really know her ethnic affiliation) standing in front of an open refrigerator which is empty with a wistful look on her face. Of course, we don't know where the photo was taken, it could have been taken in Paris, London or Beverly Hills. All I know is that there is no famine in Gaza. Similarly, there was a popular anti-settler video on YOUTUBE some time ago. MONDOWEISS posted a link to it. It shows a quaint, rustic scene of a simple Palestinian farmer with his donkey walking along (accompanied by pro-Palestinian NGO people heavily armed with video cameras and the such) and then we are shown, on a hill in the distance, three people with their faces covered. The narrator, an English women says "oh, no, there are the settlers!". The video stops, then it starts again, the narrator says "the settlers killed the donkey!" and we are shown a dead donkey. Actually, we don't see any of this happen, in spite of the Palestinians NGO friends having video equipment. Then an Israeli policemen appears and we are told he is supposely harrassing the poor Palestinian and refusing to go after the perpetrators. Yet another crime by the "settlers". A commentor at MONDOWEISS did point out that no crime was shown in the film, but Phil and Adam got worked up into their usual rigtheous wrath anyway. It's more fun that way. All I know is that I don't know why any actual crime wasn't shown. I guess the rule is "anything for the cause!". Finally, regarding Sheikh Jarrah, I don't know why you all blame the Jews who moved in there. They are not squatters. They moved in according to a court order. If you want to demonstrate against someone, go demostrate against the court. As I understand, the Arabs living there had no claim of ownership, the land was controlled by the Jordanian custodian of abandoned Jewish property. The Arab residents could have stayed if they had a agreed to pay rent. They refused, so I don't see why the "progressives" are mad at the Jews living there. Jewlicious, good to see you are not in denial anymore about the guys' identities. But you are still in denial about their sin. "Like you said, all these kids did was sing Hebrew songs in response to the woman's clangin"
Look at their faces. Look at their contempt. Look at their desire to taunt and hurt the woman. Would they have done that if it was their grandmother? And remember, they are Americans here for a year going into an Arab neighborhood. You call that just singing? The Germans who sang the Horst Wessel lied were also "just singing". But the German's sin was much less. Because they sang a racist song, where these guys were probabaly quoting pesukim. And Y. Ben David, the apartheid laws were also legal. The question is how do you distinguish between the property rights of Jews to reclaim property in East Jerusalem and the property rights of Arabs to reclaim property in West Jerusalem? If there is not one law for Jews and Arabs in "united Jerusalem" then this is an apartheid regime. Which doesn't bother you, but does bother most folks. I am sorry but you didn't answer my question. If there isn't "one law in Jerusalem" IT IS THE COURT'S FAULT - not the Jews in Sheikh Jarrah. They are no more "immoral" than the "progressive Jews" who are living in what were Arab houses before 1948 in west Jerusalem. Why don't you convince your "progressive" friends to demonstrate at the Israeli Supreme Court? THEY ARE THE ONES RESPONSIBLE. As to the question of Palestinian property rights in West Jerusalem, lets not try to whitewash history. Property rights in Jerusalem have always been based on conquest. I know it's not pretty but it's a fact. Most Palestinians left their homes in 1947-48 in order to avoid the impending conflict, many assuming that once the Arab Armies defeated the Zionists, they could simply reclaim their property. Whatever the case may be however, it's highly unlikely they thought that if the Jews won, they'd be allowed back. Look at what happened to the Gush. Look at what happened to the Jewish residents of the Old City. Any area captured by the Arabs in 1948 quickly and unceremoniously became completely uhm... clean of Jews. Where were the protesters then? But I'm digressing. I know we now frown upon territorial acquisition based on wars of aggression, but were the Jews the aggressors in 1948? Were they Jerry? Was Israel the aggressor in 1967? At least in relation to Jordan and Jerusalem? I have no problem compensating Palestinians for property lost in 1948 to the tune of whatever it is their negotiators can negotiate. Returning property is not going to happen given valid security considerations, but we can justify compensation on humanitarian grounds. The decision regarding Sheikh Jarrah was taken by the Supreme Court and the Palestinian case for ownership was shoddy beyond belief. Go ahead and look at the evidence of their ownership, all of it obviously and badly manufactured. If you go and try to perpetrate a fraud on a court, regardless of whether you are Jewish or Muslim or Christian, said court is not going to look too kindly towards you. As for the rest of the post, you make all sorts of hasbara assumptions, none of them are true. 1. "Every place the Arabs took, the Jews were massacred." False and irrelevant. You yourself point to the Jewish Quarter, where people were transferred out. 2. "The Arabs who left their property did so assuming that they would come back following the Arab victory, but under no other circumstances." False and irrelevant. 3. "We frown today on land acquisition in wars of agression." Uh...actually, this is false. International law forbids acquisition of territory by force. The one exception is where the aggressor ceases to exist as a state entity -- is completely destroyed -- and its former citizens request to be absorbed as citizens by the new entity. That is clearly not the case here. Basically, you say that what justifies Israel's decision to discriminate between formerly Jewish property in East Jerusalem and between formerly Arab property in West Jerusalem is security. That was the same argument made in South Africa for much of its apartheid system. Whereas I say that no regime that must discriminate in this way for the sake of its security has ANY right to exist, much less a right to a secure existence. Jews have the same right to compensation for properties lost in the 1948 war as do Arabs. A legal system that was just would apply the same rules to Jews and Arabs in this regard. Y Ben David, it is not the court's fault that the laws are unjust. The court is there to interpret the law. There is only so much that a court, even a progressive court, can do under an unjust regime. The point of the demonstrations is to shame the government into changing. Of course, that is not likely. But at the very least, it will damage Israel's reputation, and I hope it will damage it badly. Because as Moshe Halbertal told me, the Sheikh Jarrah case is an ethical no-brainer. One has to be a moral monster not to agree. I really appreciate your critical analysis of this photo. I've seen it across the web, on people's facebook profiles etc. but haven't seen anyone anyone analyze it or go as far to do something about. This is exactly the type of Jewish response we need. PS: I've linked to your blog on my blog . The little boy raising his hand? Is that another false and horrifically offensive comparison to Nazis?? I was kind of surprised that you didn't take back the Brownshirt/Horst Wessel analogy but I am even more surprised that you would in fact ADD to it. That's remarkable. Really remarkable. And telling. As for my Hasbara assumptions, please don't put words into my mouth. I never said "Every place the Arabs took, the Jews were massacred." I just said they were cleansed of Jews. Whatever Jews survived the rapes and murders that took place in the Gush were imprisoned or marched off. The surviving Jews in the Jewish Quarter who weren't imprisoned (the men of fighting age) were marched off as well. I know my history. The fact remains that any territory conquered by the Arabs was in fact cleansed of all its Jews. Without exception. Thats not Hasbara, that's historical fact. Inconvenient perhaps, but fact nonetheless. Number 2 is not so irrelevant. It goes to abandonment and it is in fact quite germane. Palestinians left their homes for all kinds of reasons - fear, safety, the desire to avoid being in a war etc. Some were encouraged to leave by the Arabs, others by the Haganah etc. Some were banking on a quick Arab victory that would allow them to return to their homes, others didn't care as their families' safety was of paramount concern. Once the war was over however, Israeli security and existential concerns overruled mere property rights. Like I said, I have no objection to awarding these people whatever compensation those negotiating on their behalf can negotiate, but as a sovereign entity, Israel has the responsibility to protect its citizens and a sudden influx of millions of admittedly hostile Palestinians isn't going to enhance our safety at all. That's not Hasbarah, that's fact. Your third point demonstrates a gross misunderstanding of International law. This is neither the time nor the forum to discuss the difference between force and aggression, but your facile dismissal of my point is simply going to generate an equally facile dismissal of yours. South Africa's "security" considerations were premised on a system based solely on racial segregation and skin color. I know those on the extreme left like to use charged terminology like "apartheid" when talking about Israel - in much the same way you use false Nazi analogies, but they, like you, sacrifice truth and accuracy for drama and bombast. I live here in Jerusalem. Our long term existence as a state is tenuous and I personally am not so quick to poo poo security concerns. These aren't minor either, they're existential and real. If you feel that that means Israel has no right to exist because it is beset by enemies that force her to take strong security measures then so be it. You're entitled to your opinion but I respectfully disagree. Whatever security measures Israel has taken do not remotely amount to Apartheid, Nazism or Genocide as you have implied. Those boys were not harming that woman, they were merely reacting, perhaps stupidly, to her provocation. Life goes on. So...ethnic cleansing (the refusal to let refugees to return to their homes provided they are willing to live in peace -- see 194) is ok, as long as it is in the national security interest. Or to put this another way, the Zionists basically lied to the world when they said that they could have a Jewish state without prejudicing the rights of the natives. For they immediately claimed (and it was not as if they were surprised by Arab resistance to Zionism -- they had seen in coming from World War I) that the Arabs would be a threat just because they were Arabs. Property rights -- well, how about this. Let in the Palestinian refugees without property rights. The point was not who owned the property. The point was getting rid of 700,000 Palestinians (all of them barred by law from returning; like you, I believe that it is immaterial how they left -- the real expulsion occurred when the laws went into effect) and replacing them with Jews. Well, this is the original sin of the Jewish state, and the refugees issue -- which will not be solved -- will prove its undoing, ultimately. So it seems that having a Jewish state (as defined by the political Zionists) required a ethnic cleansing (or, at the very least, a refusal to let refugees return). If, so, it's not so much an 'original sin' of the Jewish state (which makes it sound like something that could have been avoided), but rather a necessary precondition of a Jewish state, regardless of any hostilities on the part of the native population. Do you agree? And, if so, if people who support 'the existence of a Jewish state' insist on justifying what seems like a pretty big injustice, isn't it likely that they'd continue to justify further injustices in the same of preserving a 'Jewish state'? I.e. once you take that first step, haven't you committed yourself to its further consequences? So, when you call for more derech eretz, is that really possible without calling into question the very existence of such a Jewish state? Conversely, if people are committed to such a Jewish state, is it really possible for them to heed a call for derech eretz? I'm afraid I can't follow your thinking over time. Here you say the refugee problem will not be solved and "will be Israel's undoing". In other places, you say, in spite of your anti-Zionism, that you would accept the "2-state solution" as long as Israel ends any preferences for Jews and becomes a "state of all its citizens". Well, the 2-state solution can only come if the Arabs give up their demands for the return of the refugees. Of course, as I always point out here, the Arabs will not give up their demands and thus there will not be a peace agreement. I do think you are more realistic about what the Arabs want than your "liberal Zionist friends". People like Yossi Beilin and the Geneva gang treat it like its a "humanitarian" problem, so he see bring some to Israel, send others somewhere else and give them compensation. The Arabs will never accept that because they do NOT view the refugees as a "humanitarian probem". They couldn't care less about their humanitarian problems. They view them as a political weapon against Israel. Thus, I do disagree with you that it is the "refugee problem" that will work against Israel, it is Israel's EXISTENCE that the Arabs object to and the refugees are, as I said, a weapon in the fight against Israel. In other words, you think the refugees are the cause of the going conflict, I say it is the humiliation to the Arabs of having dhimmi Jews having a state and this conflict would exist even if there was NO refugee problem. You yourself have alluded to this in your justification of Arab violence to stop Jewish immigration in the pre-state period. "the refusal to let refugees to return to their homes provided they are willing to live in peace"
OK, fine. As long as they maintain their intransigent position, I'm not going to do anything that remotely endangers my friends, my family, my loved ones and my fellow citizens. But thanks for at least acknowledging how precarious our life here is, and how almost any serious threat or problem is of the existential variety. Many countries have problems but it's rare for one to hear that said problems or issues are going to be that country's ultimate undoing. Except when it comes to Israel. So now maybe you can understand my sensitivities. "have no indication that said refugees are willing to live in peace." Why not require new Israelis, Jews and Palestinians, to sign a loyalty oath before they are given immigration rights and mainstreamed into Israeli society? Why not have Nefesh be-Nefesh, or some Palestinian Israeli equivalent, help ease their absorption? The refugees would return as full Israeli citizens, with rights and responsibilities, including military service (assuming full equality for Israeli Palestinians) They would be embraced twice, by their Israeli Palestinian brethren, and by Israel's decent society. Isn't that a vision worth working for, Jew and Arab? Or are we simply too tribal to be a decent society? Jerry asked: "Why not ask them?" I have Jerry. I've been to Ramallah and Nablus, Jericho, Bethlehem, Halhul, Gaza City etc. I've had these discussions on the streets in Montreal, in cafes in Paris, in a post office in Amsterdam. I've spoken to parliamentarians from Hamas, Fatah and the PFLP. They want to take it all. They were pretty straight forward and unequivocal about that. Look, the scenario you painted is quite generous. And I'm certain it comes from a good place. Personally, I'm kinda liking the European Union model. To think that not so long ago, these people were at each other's throats. Nuclear war was a constant threat. The Continent has a long and bloody history spanning generations! And now? Now members of the EU can freely waltz in and out of each others countries without fuss or fear. How likely is it that Germany invades France? That Spain invades England? That a nuclear missile will be launched from Romania? It's unimaginable! It's a small, small world and getting smaller every day. I'm already at a point where I care more about the integrity and intelligence of my political leaders than I do about whether or not they are Jewish. It'd be awesome to have a pan-Levantine union! I could take a bus to Beirut and taste for myself what the fuss is all about that hummus of theirs. I could go shop in Damascus, visit Palmyra or see Aleppo. We could all work together, Muslim, Christian and Jew, in peace, harmony and prosperity. How great would that be? And that's not a pie in the sky fantasy either. I think it's where the world is heading. However, this is not the time. There's still too much hatred against us out there. The Arabs and the Palestinians are simply not ready for peace. Take a look at my YouTube channel - look at the vile comments I get every day on even the most innocuous videos. I'd love to see the Palestinians live in peace. I'd love to see them happy and prosperous and optimistic. But not at the expense of my bodily integrity. Sorry. Can't do it. It's ironic to me that I agree with elements of your letter, even if I disagree with some of your recommendations, because then I read your comments and find myself in total disagreement, especially your "original sin" claim and your belief that the solution lies in a single state for all. Israel IS a decent society, Magnes. It has much to work toward in becoming an ideal society, but it is certainly a decent one. I refer to its democratic nature, to its free press, to its freedom of expression, to its Socialist foundations that provide a safety net for many of its citizens, to its strong courts, to its military's attempt to fight wars with a minimal amount of civilian casualties and to its multiple offers of peaceful compromise to settle the conflict with the Arabs. Do tell us, however, on what historical basis can you promise us a more decent society once Jews and Arabs live together in Israel with a population percentage that give the Arabs a majority or a parliamentary majority or coalition veto power? Do you base this on the governance in the PA? Perhaps upon the Hamas government in Gaza? How about Saudi Arabia, Jordan, Syria, Iran, Egypt, Yemen, Morocco or Sudan? Do you base this on the Arab reception to the Yishuv before 1948or their leadership in those years? How about their charters? Are you concerned that a people whose charters reject the historic connection of the Jewish people to the Land of Israel, will then act according to the beliefs that informed those charters? Are you concerned that people who prohibited all access to Jewish holy sites under their control in 1948-1967 will act differently once in power? These are serious questions, ones which need to be answered with something a little more meaty than idealistic words about how everybody should live together in peace and harmony and further inane accusations of "tribalism." Don't ALL of the societies surrounding Israel reflect very different sensibilities and mores than what we consider to be free, fair and democratic when it comes to how things run? Aren't they all "indecent" societies based on the values you express as ideal for Israel? What evidence do you have, if any, that in your utopian Israel/Palestine things would be different? Another question for you. Why should a society agree to change its own make-up in terms of population and social values and norms? Is it always indecent and bigoted to reject those who have different values? Are we really all the same? If so, then why are the societies I list above different from Israel or the US? Another question: why hold Israel to this standard, that it must reinvent itself entirely, in order to appease your heinous and wrong-headed accusation of "original sin?" Is it ethnic tribalism when Germany refuses to open up citizenship rolls to people clamoring to get in but has a return" law for "ethnic Germans?" How about Ireland which has a "return" law similar to Israel's? Should all countries that have been embroiled in conflicts over land permit all parties, even if generations have passed, into their land? Since those societies might have changed dramatically over those generations, should those societies be concerned about how they might be changed as a result? Is it moral for them to accept these changes? Oh, and another question, since the children of the refugees from Arab lands to Israel can't really go back to most of those countries, how will you address the injustice done to them (no propaganda about how this had nothing to do with the Palestinian refugees, please, because the obvious response to that is this was a large regional war and that if it had nothing to do with Palestinians, then it certainly had nothing to do with the Jewish Moroccans or iraqis). As I've learned already, I expect that you will pick and choose only those questions that play into your views and that you will accuse me of being long-winded or bigoted. Maybe you'll blame me for being Kahane's long lost cousin. Who knows? Please know that I reject your accusations as nothing more than an attempt to obfuscate the weakness of your argument. "They want to take it all." So do we, and so did we. Except that more of them are willing to do a serious compromise than we are. I don't know more than a handful of Hadash supporters who support a genuine two-state solution.
" The Arabs and the Palestinians are simply not ready for peace." And so the way to make them ready is to f-ck them every day, the way we have been doing for the last forty three years under Occupation, not to mention the twenty plus years before that? The question is not why there aren't more Palestinian peaceniks; the question is why there aren't more Palestinian terrorists? What's wrong with those people? Anyway, if you are right, then I don't see how you can justify Israel's existence. If the security of a state requires the ongoing occupation of millions of people until they are "ready" to live in peace with the first state (give me some other historical examples here) what decent person would support such a state. Jewilicious, with all due respect, you simply are not serious when you make these claims. You can wring your hands, and talk about how you would love a different world, a different Palestinian, the ability to wipe humus in Damascus. But you are simply not serious. Because you and your children and your grandchildren can go to sleep soundly without being bothered by the morally obscene situation going on here. You will have your little rationalizations. That, in my opinion, is the disease of Zionism. We have been convinced by an ideology that says Jewish survival requires a state (it never did and it doesn't now), and that that state trumps all other considerations. So we can sleep at night because despite some small moral qualms, we can always pin the blame on the other guy, and say, "Hey, it's them or us." Have you noticed how this has not been bought by the rest of the civilized world? Other states may have good reasons (of power relations) to sit with us. But what serious thinker defends Israel and its policies anymore. You guys just lost Peter Beinart, the liberal hawk who cheered American into a disastrous Iraq war. So, please, don't say Israel is ready for peace but Palestinians are not. None of the Zionist parties are ready for a genuine, fair compromise, a two-state solution. My posts are always more thoughtful than my comments. You can skip them. Why do you feel that the Israelis are so weak, that they are some fabled golus yidden who would have to be at the mercies of the merciless Arabs. You ask me to consider the following scenario: Israel decides to go the Arabs and say, "OK, we screwed up; maybe you can do it better." And then we will wait to hear what the paritz has to say and hope that we survive it. Hello, there are five and half million Jews here; we are the strongest nation in the region; what we want will obviously have some weight in any future regime. You know how many whites argued that South Africa's security required apartheid, that based on the their knowledge of the blacks, they knew that the whites would be exterminated. And a lot of whites left because of that fear, or for fear that they would lose out in some way. Well, obviously some of them did lose out in terms of privileges. But many did not, and South Africa, with all its tremendous problems, is still a better place now for mofe of its citizens than under apartheid. But Israel's situation is even better than that. It is in a much better position to negotiate than the whites were in South Africa. Anyway, all this is theoretical. If there were a genuine two-state solution, I don't see the need for much change to Israel; amending the law of return (better, superseding it), educational autonomy for Arabs, etc., a constitution that will make it more in line with a liberal democracy for all its citizens than the current ethnocracy. By the way, you should read my post on what Israel can learn from Germany with respect to immigration laws. As for Israel being a decent society, it certainly is one for Israeli Jews. Jerry wrote: "And so the way to make them ready is to f-ck them every day, the way we have been doing for the last forty three years under Occupation, not to mention the twenty plus years before that?" Right-o. It's all on us. No reference to corrupt Arab and Palestinian leadership, no reference to Pan Arab and Islamic disdain with the notion of sovereign Jews. Nope. It was just us "f-cking" the Palestinians. They had nothing to do with any of it. Nope. Believe me I sleep very well Jerry. The only logical conclusion one can come to from your comments, where you liken us to Nazis (!!) and our existence to moral obscenity, is that we should all pack up and dismantle the state. You don't believe Jewish survival requires a State and I do. The diaspora either loves us to spiritual death or hates us to actual death. Israel represents an attempt to end that cycle and I for one am not ready to give up on the whole thing. Sixty two years is a blip in history and while I don't see Zionism as the prima facie moral obscenity that you do, I'll keep working on making it better. That having been said, I'm not a pacifist. Judaism forbids us from being pacifists. When the equation is them or us, I will always choose us. And I am not alone in noting that our best interests, and those of the Palestinian people include "a genuine, fair compromise, a two-state solution." Sorry that doesn't jibe with your world view. Weepy Peter Beinart shares your myopic world view and fails in his analysis for the same reasons you do. It's not all about the Jews. re responsibility: Jewilicious, it's not all about the Jews. It's all about the people with power. And in the story between the Jews and the Palestinians, the people with the most power have the most responsibility for the mess. Anyway, we obviously disagree. You are willing to pay a heavier price for a Jewish state than I am, and your belief in it is a matter of faith not to be confused with facts. You accept the Zionist dogma that the 1948 Jewish state enhances Jewish security, despite historical evidence to the contrary. You would be willing to sacrifice a million Jewish lives if necessary to defend a Jewish state, because you assume that a state is what Jews need to survive, despite the fact that Jews have outsurvived many other peoples who had a state. I can't argue with that, any more than I can argue with somebody that Jesus is the messiah. Ask yourself, though, who are Israel's supporters now, who they were forty years ago, and who they will be forty years from now. Of course, you don't care who supports Israel or who Israel supports -- because of your conviction that Israel is necessary to preserve the Jewish people. So let me ask you a question. What could Israel do to the Palestinians, in the name of its security, which would not allow you to sleep at night? Where is your red line? You misread my comment on the refugees. I said, "Why not ask them if they are willing to live in peace as Israeli citizens." I daresay you have not asked a single Palestinian refugee that question. You misinterpreted me to saying, "Ask Palestinians whether there are willing to accept the state of Israel as a Jewish State." Hence, you completely ignored everything I wrote about a rational and just approach to the refugee question. My red line? Heh... what will it take for you to support a Jewish state? Or do you see a Jewish state as unnecessary? In any case, whatever my red lines are, my assessment of whether we've been moving closer to them or farther away from them differs from yours. And I'd love to have productive discussions on the topic with people who really care and can see beyond their ideological blinders - people who don't distort reality by making use of Nazi analogies when none remotely apply - clear minded people who really have the best interests of all people in the region. Those interests are not aided by distortion and dishonesty. So I'll do what I do, and you do what you do, but I pretty much know which side of the equation you are on. Jewlicious, what would it take me to support a Jewish state (ideologically speaking, I mean)? My vision of a Jewish state is close to that of Berny Avishai's in the Hebrew Republic. It is not an ethnocracy but a liberal democracy in which Jewish/Hebrew culture would have a dominant role. Again, and with all due respect Jerry, you have no idea who I have spoken to. Most Palestinians do not currently accept a final disposition that includes a Palestinian state within the 1967 borders. At least according to the Al-Najah Poll. As for what the refugees want, you can look at a Palestinian Center for Policy and Survey Research Poll and see for yourself. Only 10% were willing to accept a return to Israel, with or without Israeli citizenship. if you think that rav kook who you invoke here alongside hannah arendt et all in their views of zionist didnt have more in common with BG and the labor zionists who you describe as esau in the guise of yackov in your beinart post then let me know what history books you read. also what rational person would think that the dershowitz read at most by 50k american jewish students (very very high estimate) has done more to prevent peace in the middle east than any (mandatory) schoolbooks issued by the PA. If you are going to put that label on something on the zioist side at least pick something used by the israeli school system. What do you mean when you say "Judaism forbids us from being pacifists. When the equation is them or us, I will always choose us." 1. "Judaism" = G-d? the rabbis? can you provide a reference for this? 2. more importantly, what do you mean forbids "us"? as individuals or as a people? I know the verses allowing aggression for personal self defense (something most pacifists would agree with), but it seems that you are implying that "Judaism" (whatever that means) orders every individual to be non- pacifistic when he/she feels that our people (as a group) are in danger. Can you provide a source for that? moreover, can you provide a source which says that he/she can provide that assistance through a state structure? 3. Do our people= the State of Israel? 4. Who gets to decide if our people are in danger? you? the state? "Judaism"? As this is a fascinating comment by you, I would be happy if you could respond. I'd love to assign a photographer to follow you around, find a photo that makes you look like a hateful moron, take it out of context, and post it on my blog. At the age of 20, during the 1974 war, I dropped out of college in the U.S. and committed to work on a kibbutz for six months to replace members in the reserves. It wasn't orange picking. It was hard cowshed work and most of the other volunteers in my kibbutz came from Europe. I really loved Israel that much, and my experience brought more joy than pain. I debated returning back to the states. While my time in Israel convinced me of the diversity of the society and how closely it's divided, I cannot help but be disheartened by the nation's current trends. The truth is that I hate fundamentalism of all kinds. But I hate Jewish fundamentalism most of all -- exactly because we should know better. I can no longer bring myself to defend Israel and I used to be full of all the easy rationalizations about the occupation. Worse, I cannot encourage my sons to do so either. Instead, I remain silent. Jerry, I'm sure some of those expressing opposition to your post would say, "Good riddance." I personally pray that Israel is only going through its Neocon moment and that the wisdom of Magnes, Ben Gurion and Rabin will one day return. On a less polemical note, there are a number of Yeshiva high schools in the New York area that have been teaching Arabic for a number of years. You know, between talking to Jewlicious and to me, you failed to answer key questions but you inserted Nazi and SA apartheid analogies. Effective, but tasteless. Israel is also a decent state to its Arab citizens. Those, for example, who study in its universities and then go out to the world to preach about boycotting the state that subsidized their education. Or those, for example, who can vote, as opposed to their sisters in other regional countries. Those whose standard of living is higher than that of most other Mid-East Arabs. Those who received state funds for having more than 3 children. Yes, we've already discussed and I've acknowledged there's discrimination, but we differ on the reasons. You ascribe bigotry and I am confident that it's because of the conflict. You can see it with Mr. Jewlicious, who dreams of wiping hummus in Damascus. Either way, you did not address most of my questions. Not too surprising. Your response seems to be that somehow all will be well because there are 5.5 million Jews there. I'm asking you real-world questions and you're answering with a utopian vision that ignores the challenging issues raised by my questions. Be an idealist all you want. It's easy to be one. In the real world, things don't work that way, as those early Zionists learned the hard way 90 and 100 years ago. And frankly, it would be much easier to swallow your idealism if you didn't mix in "original sin," "apartheid" and "Nazism" analogies that represent an extreme point of view about Israel. So much talk about history, and so much ignoring the people. Can only a handful of viewers see the people *as* people? When I posted this picture on my Facebook page I asked a simple question: "Who would you prefer to have as a neighbor, the old woman or the boys?" Not the old woman as a representative of Palestinians, not the boys as representative of Israelis (or Americans). The people themselves. Answering my own question: I would rather live next door to the old woman. 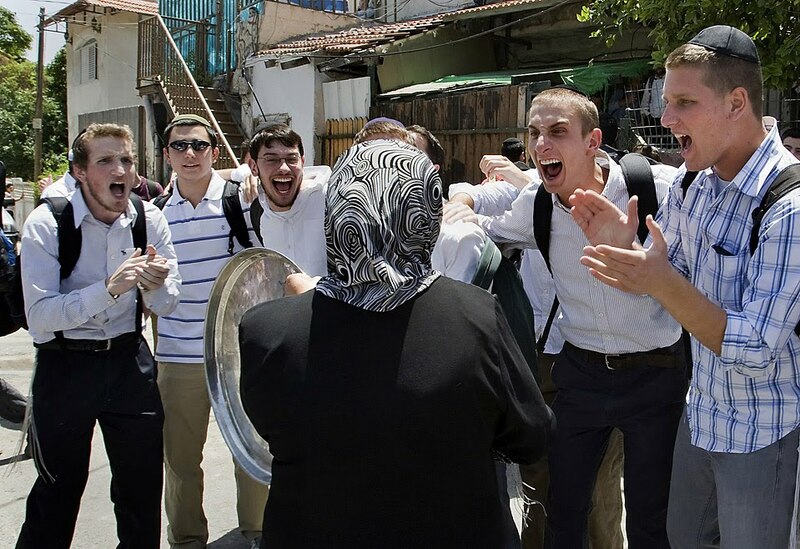 Facebook Picture Person, And if the woman was yelling itbah al yahud and the boys were responding by singing Am Israel Chai? Would that also make you wish for her as your neighbor? "We have been convinced by an ideology that says Jewish survival requires a state (it never did and it doesn't now)..."
Are you certain you wouldn't have felt differently a hundred-odd years ago? Were such sentiments delusional then? At any rate, these sentiments, which IMHO were not delusional at that ime, set the wheels of eventual Jnationhood in motion (and I know there were Zionists who did not embrace Jewish statehood). Once the Jewish nation is established, how do you actually roll it back to achieve a non-ethnic state of all citizens? Do you believe such a thing is now possible without catastrophic violence? It seems to me that a two-state solution, adhering to your fairly rigorous principles, actually has more of a chance of succeeding and is even more politically plausible than a one-state solution -- and I'm no optimist. Also, out of curiosity -- I assume that when you settled in Jerusalem you didn't see Israel's 'original sin' as a fatal flaw, as you now do. When did you have that epiphany? evets, I have declared myself agnostic about possible political solutions, by which I am not wholeheartedly in favor of any one, precisely for the reasons that you suggest. What I want is to take into account the legitimate rights of Israelis and Palestinians, and to see how things can be accomodated. I also am against catastrophic changes, if by that you mean those that entail suffering and violence, that would add to the present suffering and violence. Anyway, you ask how I would feel in 1897, and I don't know how I will feel a week from now. I have gone on record saying that I blame no one for supporting the statist option in 1948; I can understand the strong appeal, especially given the historical context. Just as I certainly understand the Palestinians who thought (and think) that Jews have no national rights of claims in Palestine. The question is always, where do we go from here, where the "here" is constantly changing. As for my "epiphany", it happened after Camp David, when I realized, for the first time, that the Palestinian position was far more generous and reasonable than the Israeli one, and that the Israelis (especially Barak) was doing what he could to derail a two-state solution. I supported Barak in 99; today I would probably support any Israeli politician over him. And, of course, the Second Intifada cemented my belief that the Israelis -- or, if you will, the Zionists -- were the biggest obstacle to peace. One word of clarification. When I heard what Barak was offering, I understood why the Palestinians had to reject it. But his "we have no partner" strategy turned me off entirely. And then I saw that his position was that of mainstream Israelis, who think that the West bank and Gaza are gifts from Israel to the Palestinians. I am mystified as to why you think the Palestinians were "right" to reject Barak's offer, yet at the same time you are willing to "generously" give the Palestinians everything over the Green Line (that is the pre-67 "West Bank"), when you yourself admit that this does not BEGIN to redress the wrongs Zionism did to the Palestinians, as you see it. They are not fighting for a "reasonable" settlement that you seem to think they should take, they are fighting for what they view as "justice", the eradication of Israel. On Nakba Day, sheiky Raed Salah, one of the leaders of the Israeli Arab Islamic movement said that there will never be peace without a FULL IMPLEMENTATION of the so-called "Palestinian Right of Return", something no Israeli gov't will ever agree to ( what is your position on this?). Thus, there is NO possibility of a peace agreement along the lines you want. The more I read your writings, the more confused I get. What is it that "progressives" really want here in Israel? You, more than most "progressives" I read are willing to listen to what they Arabs actually say, and I would agree that leaders of all the parties in Israel have a long history of totally ignoring them, negotiating among themselves about what the Arabs are going to get and then telling the Israel people that the Arabs will certainly accept such generosity from us. You are quite right to point out the folly of this, yet you yourself fall short and end up doing the same thing, assuming YOUR "red lines" are the "rational ones" unlike Barak's "unrealistic" offer which you ridicule. The Arabs have made very clear your offer is just as bad as Barak's. That's funny, it was Camp David that removed me from the camp of the Left and moved me toward the center. The Palestinians did not negotiate in good faith at Camp David. Even by Malley's account Qurei and Arafat sought to undermine the talks. Qurei himself related the story of how Clinton slammed his palm on a table demanding something from the Palestinians and from that point on, he took steps to undermine the talks. However, your position doesn't take into account the major position change that Barak brought to the table at Camp David. Jerusalem was considered a third rail for all Israeli politicians and he opened that city up for negotiation. That was a HUGE move. The Palestinians reciprocated with nothing. Literally nothing. Your position also doesn't take into account that even after the Palestinians launched an unjustified and inexcusable war after Camp David, Barak went back to the table with the Clinton Parameters. You can complain all you want about Camp David, but once the Clinton Parameters are on the table, you have no excuses left. At the very least, a serious negotiations should follow after such an offer by Israel. Instead, as anyone can see by reading the Moritanos report on the negotiations' endpoint, the Palestinians did not budge on any element. They did not budge on refugees, on Jerusalem or on the Temple Mount. Ben Ami told Ha'aretz later that at least Israel finally saw a Palestinian map. It showed an extremely slight modification to what had been under discussion at Camp David. Even the rabid Lefty Ha'aretz reporter asked in incredulity whether that was all the Israeli leaders got after all of those negotiations and changes in the Israeli positions. Ben Ami acknowledged that this was all they got. Ben Ami expressed surprise and disappointment, but those of us who are less naive understand that the Palestinians did not and do not wish to give up their dream of taking over Israel. If you need further evidence, consider that Olmert went even farther in his offer than did Barak at Taba. Yet, again, the Palestinians rejected the offer. There are no more excuses. By stating that you are agnostic on the final outcome, you are actually abdicating a serious position on whether people have a right to self determination, whether Israel has a right to exist and whether the Palestinians want peace or are actually stalling until they believe the time will be ripe to attempt to destroy Israel as a Jewish state and the morality of such a position. At least be honest about your position and what you support: a single state where an eventual Arab majority will rule. how do you understand the first rashi in the torah? Anonymous, I have no koah to discuss Camp David. You may have been in what is called the Israel left camp, of the Zionist left, but I am increasingly viewing that phrase as an oxymoron. Anyway, you don't seem to understand that I consider the Geneva Initiative to be too little, too late. So why would I consider Taba a reasonable offer? Y Ben David, I am sorry to confuse you. I said that I am willing to support any reasonable compromise that provides the most justice, redress of historical grievances, parity and peaceunder the circumstances. That could be one state, two states, federation, etc. I would not support any solution in which the leaddership of the Palestinan people agree to subordination to the Israeli in a neo-colonial relation. But, as you know, I don't see any solution around the corner. And my message is that where there is no solution, it is better to expend resources to exposing and fighting injustices. As a religious Jew, I believe that God promised all Eretz Yisrael to the Jewish people. As a moral human being and as a Jew, I also realize that my belief has absolutely no political implications for the present situation. So that Rashi, like the flowers that bloom in the spring, have nothing to do with the case. makes things much clearer now. oh, and i take it that you were at camp david and taba...cuz dennis ross sees things much differently then you do. No "Jerry," the oxymoron is the Left supporting Islamists who seek to destroy Israel. You're the oxymoron. You just wrote a blog trying to fundraise for a group that is calling for the extermination of Jews. The very first thing we teach children in kitah hey is that where there is no mitzvah of hashovas aveidah then the first way to stake a claim to private property is capture. (Eilu Metziyos begins by discussing Capture. Eilu Metziyos shelo. Only having established that we move onto the mitzvah l'hachriz in certain limited circumstances.) One could sleep through a decade of yeshiva education, but one value you cannot miss is the central value of property rights. How beautiful therefore to see these Yeshiva boys intuitively understanding that the owners of this property - according to Shari'a under the Ottoman Caliphate, according to British Common Law under the Mandate, and according to the odd hybrid of Common Law and Shari'a practiced in Jordan* - have a right to unmolested use and enjoyment. Even the hard left Supreme Court of the Memsheles Zadon imposed a settlement where the residents would live there as "protected tenants" - a uniquely Israeli legal status - and the owners would retain title. The squatters now refuse to pay rent. According to Ottomon Shari'a Law (which registered the property in the names of its Jewish owners, notwithstanding some clerk in Constantinople may have one year addressed the Arnona invoices to the "Resident of . . . "); According to British Common Law; According to Jordan's hybrid Common Law/Shari'a system; According to Israeli law - there is mutual consensus that the squatters who refuse to pay rent have got to go. How can you call yourself an Orthodox Jew and not respect the owner's property rights?! How can you be morid b'malchus like this! (not just a meridah against Ottomon Shari'a law; not just a meridah against British Common Law; not just a meridah against Jordan's Common/Shari'a Law hybrid; but a meridah against the far left memsheles zadon entity. * Reality is more complex. Jordan is a nonfunctioning barbarian state. Things don't get litigated - the strongest clan leader decides and that's it. But in theory if the King's Writ spread beyond one tony neighborhood in Amman, then the law that would be applied would be a hybrid of British Common Law and Sunni Shari'a law. Well, here is an Israeli leftist discussing Israel's "original sin." Thank you for your insight. It must've been difficult to write, so I can only thank you from depth of my heart for making the effort. As long as people are infected with malignant religious memeplexes that "link back" to a more primitive time, there will be war. "Sin" functions as part of the memeplex to assist in its propagation. Let these out-dated ideas go before we have nuclear war.